LIVE or ON-DEMAND, the 2019 CEU Package offers convenient online webinars on your schedule at your pace! Click "Register" in the upper righthand corner of your screen and unlimited access can be yours. Choose any web seminar - live or on-demand - in the eAudiology library (more than 200 chose from). This is a great opportunity to earn your CEUs at an incredible savings! 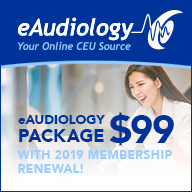 (Members must log into eAudiology with their Academy ID to access the special member pricing). Register early and receive bonus access to eAudiology beginning October 1. Please note: CEUs must be obtained by December 31, 2019. Live or On-demand, the CEU package offers convenient online education on your schedule at your pace. Those who are not members of the Academy can purchase the CEU package for $399.